You’ve probably been wondering where I’ve been. The short answer is: I’ve been sick. Well, that’s the long answer, too. Here’s what’s hoopy in my life during the past few days, excluding the past three, since I was, well, sick. 1. Hooping.org’s 30/30 Fall Challenge: I did it! I hooped for 30 days! Yay! The results? I got a lot better at what I’ve been learning in my classes. And I wore a nice trampled-down brown spot my yard from where I was practicing. 2. Studio Spin’s Masquerade Party: Joan and I attended Studio Spin’s Masquerade party on Nov. 1. It was fun! I participated in the student showcase. It went ok, but I had a lot of fun. 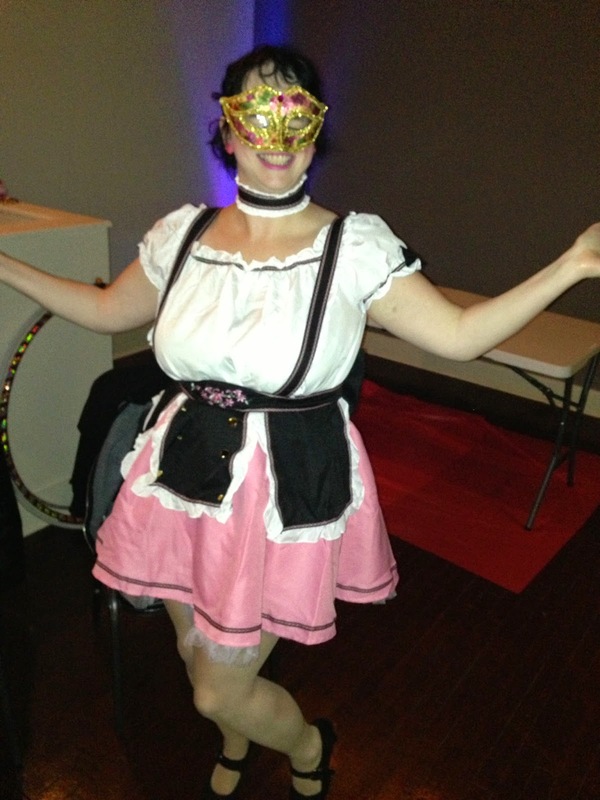 I did the Chicken Dance while hooping in a dirndl, or a traditional German dress, costume. Here’s what I learned. Poofy polyester dirndl’s are not good to hoop in. I took off the black piece to perform, and, of course, the mask. Here’s a video of my performance, hoop drops and all. I should note that while Joan was filming this, my phone did run out of memory, but most of it is here. The good thing was that I had a good audience response. I also had a few people come up to me and try out hooping, so at least I got some interest and met some new people that way. Next performance? It’ll be in a short top and leggings like I’m used to. Here’s the Vimeo version is you like that service better. Hooping Chicken Dance from Jenn Dixon on Vimeo.